The labrum of the shoulder is a cartilage bumper along the glenoid (socket) that serves to deepen the socket and help provide stability to the shoulder. It is a common injury to the shoulder, and it is being recognized with more frequency in athletes. A tear of the superior labrum (the labrum at the top of the shoulder), also known as a SLAP tear, is frequently seen in pitchers and other throwing and overhead athletes. SLAP tears are also seen in contact and collision sports in which an athlete is hit on the shoulder or lands on the shoulder or outstretched arm. Athletes can suffer pain and limited activity related to the injury for a long time prior to being diagnosed with a superior labral tear. Frequently the location of the pain is somewhat nonspecific, although many athletes will complain that the pain is felt deep within the shoulder. Physical examination is difficult in that there is no specific test that definitively makes the diagnosis. Often the diagnosis can coexist with other shoulder issues, including subtle instability of the shoulder, tightness of the posterior capsule of the shoulder, and rotator cuff impingement or tears. Initially management is focused on rehabilitation of the shoulder. Strengthening the muscles around the shoulder and upper arm, stretching the posterior capsule of the shoulder, working to improve the mechanics of shoulder motion, and core strengthening are among the methods employed by physical therapists to decrease a patient’s symptoms. In high-level athletes, especially pitchers and other overhead athletes who are not improving, an MRI may be performed. Often an MR arthrogram is needed. This is a test in which a radiologist injects contrast into the shoulder prior to an MRI being performed. The contrast within the shoulder will travel between the glenoid and the labrum if a detached SLAP tear is present. The addition of contrast can decrease the chance that a SLAP tear will be missed. Surgical treatment of a SLAP tear is indicated if the athlete is not improving, and the symptoms prevent him from performing his sports activities. The technique employed surgically depends on the type of tear found. Typically the procedure is performed arthroscopically through two or three small incisions. The surgeon will look at the labrum and determine if the tear is stable or not. If the labrum and its attached biceps tendon can be pulled off the glenoid, then the labrum and biceps tendon anchor must be repaired back down to the glenoid. If the labrum is frayed but not unstable, the surgeon can use an arthroscopic shaver to smooth out the labrum. 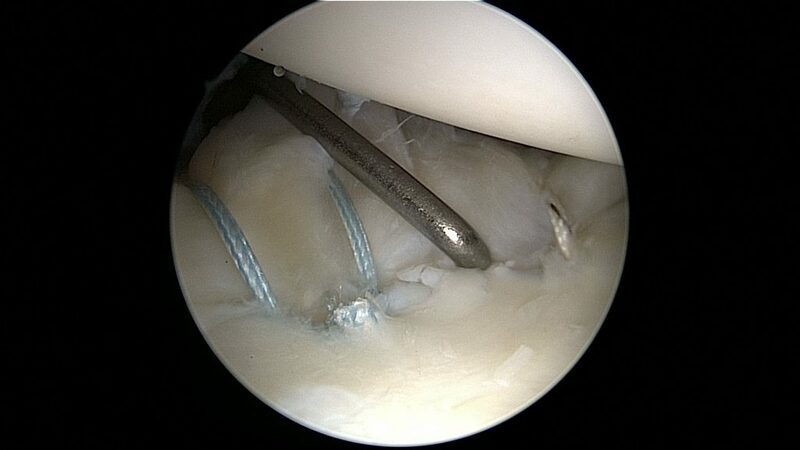 Arthroscopic repairs for SLAP tears. The length of time it takes the athlete to progress through the rehabilitation and return to sports depends on the nature of the surgical treatment. Typically recovery from a debridement (trimming or smoothing) of the labrum is fairly quick, as the patient is allowed full range of motion almost immediately. Strengthening and return to sports progress fairly rapidly. On the other hand, if the labrum is repaired, meaning that stitches and anchors are used to hold the labrum down to the glenoid, then the recovery is much slower. The surgeon has to get the repaired labrum to heal in the proper position. Too aggressive motion and strengthening shortly after a repair can stretch out or even disrupt the repair. In this setting, motion is slowly regained over 8 to 12 weeks. Then throwing can be started between three and five months. In a pitcher or other high-level throwing athlete, a SLAP repair can take six months or more to return to the same or higher level of sports.